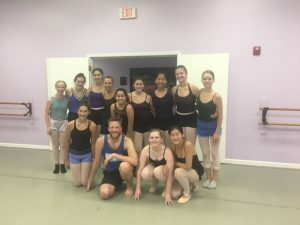 Each year, BDE employs professional guest artists to conduct master dance classes for advanced instruction in ballet, modern dance, jazz, and pas de deux. These classes are open to the public. In August 2018, BDE was pleased to offer master classes in Contemporary Jazz, led by Mr. Wade Schaaf, and in Pas de Deux, led by Mr. Guillermo Leyva.